The sightseeing trip to Manhattan was, in my mind, a winter excursion filled with roasted nuts and fat, silent snowflakes, colossal Christmas trees and apartment-sized crystal clear windows with sparkling holiday displays. Even though Christmas had passed, the horse-drawn carriages would still jingle their holiday bells and Winter Wonderland would be playing in department stores. With a jolting return to reality, let me describe the real sightseeing trip, sans my mind’s whimsical eye. We put off our visit to Manhattan to take in the sights of Rockefeller Center and Bryant Park’s Christmas Trees and holiday window displays because we really wanted to go when the weather was a little more festive… that is to say, wintery. The white stuff refused to make an appearance, though, and Christmas had come and gone before I finally admitted that we would have to take the trip in the bitter cold and parched late-December New York weather if we were going to see anything at all. The very weekend after Christmas Day, we found ourselves outside the southeastern tip of Central Park, being buffeted by a dense post-holiday shopping crowd the size of Manhattan. We cleaved our way through the maelstrom and, after much shoving and being shoved, halted in front of the Bergdorf Goodman window displays. Oh and they were spectacular! The amount of care and creativity that went into every minute detail of the displays was astounding! The themes of the displays hovered between fantasy and history with steampunk fashion and brilliant colors. Momentarily awed, I didn’t immediately notice that although the displays were everything I had hoped for, my whimsical expectations of everything else were withering quickly. The north facing windows were eclipsed in the late afternoon glare, so I wasn’t able to take a photo that showed anything more than a great square of dull grey light. In order for me to get a decent look, I had to scoot so close that I risked pressing my nose against the window; from the patchwork of smudges on the glass, evidently I wouldn’t have been the first. Propelled by the ever-moving river of tourists and shoppers, we swung around the corner and were faced with even more displays and, if possible, even more people. The gum-dotted sidewalk was no longer visible between countless pairs of boots shuffling back and forth in front of yet more glittering and perfect window displays. We were able to take pictures this time as the glare was blocked by flanking buildings. After about two dozen attempts, I even managed a photo or two that didn’t have the towheaded mop of an awkward German tourist bobbing along the bottom. 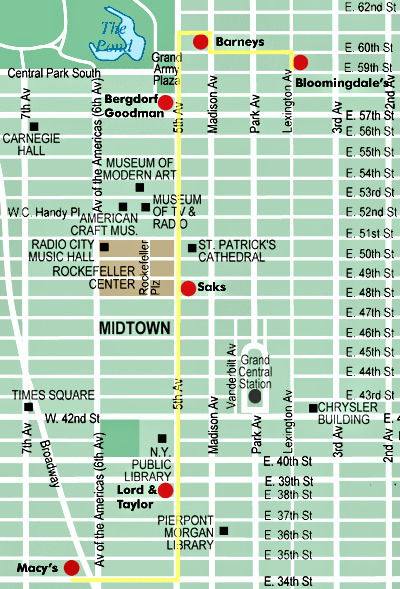 Through the usual honking and hollering of New York City, we continued on until we reached Rockefeller Center: the next stop of our sightseeing tour around the City. What dimwitted reasoning led me to believe that we might actually be able to approach that iconic Christmas tree on the Saturday after Christmas Day is lost to me, but reality hit like the kajillion people with the same idiotic idea as we entered Rockefeller Plaza. Since we were already there, we figured that we might as well try to sneak up to the larger-than-life tree and get a photo or two. We made our attempt and zigzagged through the crowd of gawkers like true professionals, but when we were about twenty yards from our destination, we hit a brick wall of iPhone selfie photo ops, realized that we were inadvertently photo bombing about sixty-four of them and aborted the mission entirely, scrambling away to the relative safety of the plaza sidelines. There we were entertained briefly by a few of the most remarkably downtrodden costumed characters (including a paunchy Spiderman who was also taking a selfie) and moved on to admire the window displays at Saks Fifth Avenue. Bryant Park was thankfully much less crowded and, although the Christmas tree that towered over the ice skating rink was puny compared to the one at Rockefeller Plaza, it was still beautiful and totally approachable. Our excursion was brought to an end after we picked up a couple bags of roasted nuts (at least I got that part right!) and visited the last few windows at Lord and Taylor. Expectations: Beautifully perfect visit to the city with outstanding decorations, storybook winter weather, smiling people and a flawless memory to take home. Reality: Loud and dirty city with angry, annoying and lost people hell-bent on keeping me from taking home a flawless memory. Still… pretty perfect decorations. What’s the moral of the story? I need to relax on my expectations, because, well, I live in New York City and it is always going to be a love-hate relationship. I love everything about it and I hate everything about it. I can’t wait until we leave and I never want it to end. I want to experience everything and forget nothing. I can’t always rely on my memory, but I can rely on at least one of eight million inhabitants to photo bomb my experiences. This is New York.